A lot of DIY handymen love to work on their homes, and that’s totally cool. However, when it comes to full-on home renovation, you can’t just knock out a wall and get to work. Removing a load bearing wall can actually cause a ton of damage, and it often takes an expert with professional training to identify the types of walls that can easily be removed. Need a little help on your next project? WHAT IS A LOAD BEARING WALL? A load bearing wall is any interior wall that supports the weight of the overall structure, from the roof to the foundation. These walls keep the structure standing and are necessary to maintain support of the structure. The demolition of these walls should be undertaken with extreme caution for the safety of those involved with the project as well as the ongoing structural integrity of the building. 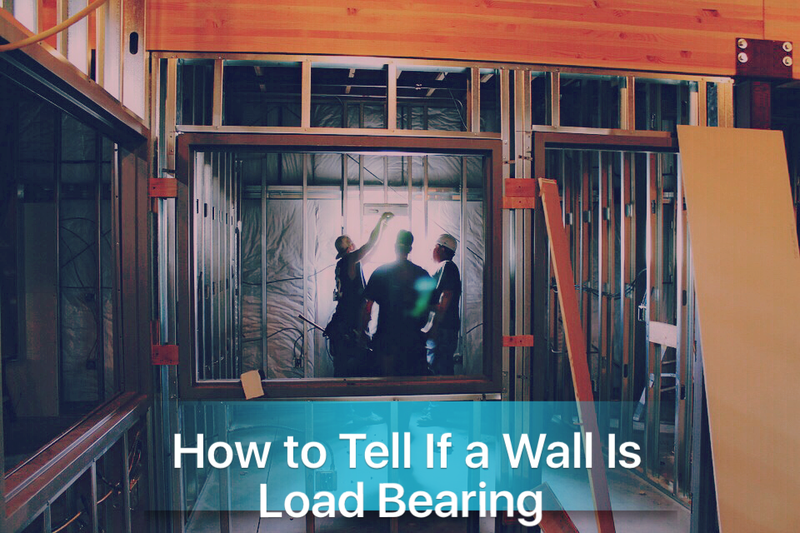 If you’re unaware on how to tell is a wall is load bearing, this guide will answer all of your questions. Load bearing walls support the structure from the roof down to the foundation and are key to keeping your house standing. Non-load bearing walls need only support their own weight and are not an integral part of the structure of the house. Non-load bearing walls can be altered, moved, or removed completely without any impact upon the overall structure of the house. Making changes to a non-load bearing wall can be handled by a serious DIY enthusiast if it is first ruled out that any walls to be altered are load bearing. Alterations to load bearing walls are complex projects, and the danger of accidentally making changes to a load bearing wall cannot be overstated. Check with an architect or engineer before starting any project that involves the removal or alteration of any internal wall. Masonry Walls – These walls are constructed with cement or cinder blocks and are incredibly substantial; they can vary in thickness. Cavity Walls – These walls contain two leaves that are joined together with metal ties. Faced Walls – The backing and facing walls are joined together and can be constructed of differing materials. Veneered Walls – The facing and backing are fixed together, but the two walls are not attached. Load bearing walls go down from the attic to the foundation and will have metal i-beams or multi-board beams attached. Any walls above these beams are most likely load bearing. Another indicator is that most load bearing walls run perpendicular to the floor joists, although this not always the case. Consulting a professional to alleviate the risk of accidentally removing a load bearing wall. Related: When Do I Need a Permit for My DIY Home Remodeling Project? When dealing with load bearing walls, it is highly recommended that the work is completed by professional contractors. The process is not a simple one, and there are many cautionary steps that must be completed, without error, to ensure your safety and to maintain the integrity of the structure. If you need help with a remodeling of your Las Vegas home, contact us today at (702) 898-7873. If you do decide to undertake this project on your own, be sure to have adequate support in place when removing the wall. Utilize studs, both nailed into the beam, and under the beam, in order to ensure that the load that had been supported by the well is properly maintained during the removal. By not providing proper support when working to remove the wall, the structure integrity can be comprised and other safety issues can arise. Again, with a project of this magnitude, it is very highly advised that the services of a professional be utilized.